This week was Cinco de Mayo. Fortunately, Mexican food is one of my favorites! I made a chicken enchilada casserole with black beans and corn for our small group. This is the enchilada sauce I used. Combine the chipotle, adobo sauce, and 1/2 cup chicken stock in a blender and blend until the chipotle no longer has any chunks in it. Chipotles are smoked jalapenos and the adobo sauce is what they are packed in. 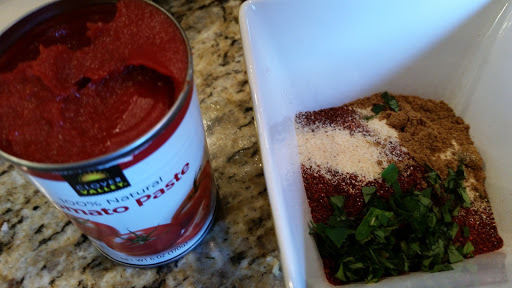 In a small bowl, add the chili powder, garlic, cumin, onion powder, oregano, and salt. Set aside. Heat the oil in a medium sauce pan. Add the flour and whisk while cooking for 1-2 minutes. Add the tomato paste, 1/2 cup chicken stock, and the spices. Bring to a light boil, add the chipotles and begin adding the remaining chicken stock 1/2 cup at a time whisking well after each addition. 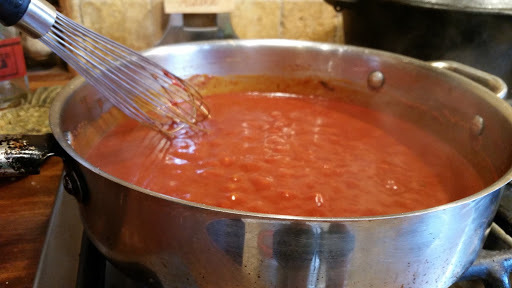 Return to a boil, reduce the heat and simmer for 5-10 minutes until the sauce is slightly thickened and coats the back of a spoon. This can be used immediately or cooled and refrigerated for up to one week.